April 2, 2012 - U.S. scheduled passenger airlines employed 2.1 percent more workers in January 2012 than they did in January 2011, the U.S. Department of Transportation's Bureau of Transportation Statistics (BTS) reported. This is the 14th consecutive month that full-time equivalent employee (FTE) levels for the scheduled passenger carriers have been higher than the same month of the previous year. FTE calculations count two part-time employees as one full-time employee. BTS, a part of the Research and Innovative Technology Administration, reported that the January FTE total of 388,778 for the scheduled passenger carriers was 7,829 more than that of January 2011. These monthly increases reflect gradual improvement in the industry's employment following declines that began in July 2008. However, the January 2012 employment growth rate was the lowest since June 2011. Of the network airlines, only Delta Air Lines, which has been eliminating duplicate positions following its merger with Northwest Airlines, decreased employment from January 2011 to January 2012. United Airlines reported 81,352 FTEs in January 2012 in the first joint report following the merger with Continental Airlines. The combined report was 4,248 more FTEs or 5.5 percent more than the 77,104 FTEs the two airlines reported separately in January 2011. 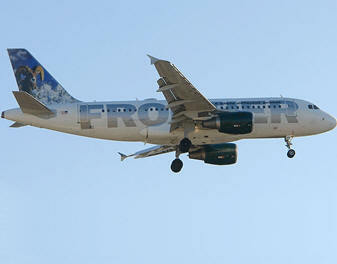 All low-cost carriers reported more FTEs in January 2012 than in January 2011, except for AirTran Airways, Allegiant Air and Frontier Airlines. The low-cost carriers with more reported FTEs are Virgin America Airlines, Spirit Airlines, JetBlue Airways and Southwest Airlines. Among the 15 regional carriers, the five carriers reporting reduced employment levels compared to last year were Horizon Airlines, Republic Airlines, Comair, Mesa Airlines and Executive Airlines. Carrier Groups: The five network airlines employed 67.5 percent of the scheduled passenger airline total in December, the seven low-cost carriers employed 17.7 percent and the 15 regional carriers employed 13.6 percent. The 2011 to 2012 increases for all carrier groups result from the relatively consistent profits for most of the industry. Top employers by group: The newly-merged United employed the most FTEs in January among the network airlines, Southwest employed the most FTEs among low-cost airlines, and American Eagle Airlines employed the most FTEs among regional airlines. Four of the top five employers in the industry are network airlines. The network airlines employed 3,907 more FTEs in January 2012 than in January 2011. Four of the five network carriers increased FTEs from January 2011 to January 2012. January 2012 numbers for United are not comparable to 2011 because of the intervening merger. Five-Year Trend: The network airlines employed 19,140 fewer FTEs in January 2012 than in January 2008. American Airlines reported the biggest percentage decline in FTE employment from 2008 to 2012, down 10.1 percent, followed by Alaska Airlines down 9.1 percent. January 2012 numbers for Delta and United are not comparable to 2008 because of the intervening mergers. Network airlines operate a significant portion of flights using at least one hub where connections are made for flights to down-line destinations or spoke cities. The seven low-cost airlines' FTEs were up 5.7 percent in January 2012 from January 2011. All low-cost airlines except Allegiant, AirTran and Frontier reported year-to-year increases. Five-Year Trend: The seven low-cost carriers reporting employment data in both 2008 and 2012 employed 10.7 percent more FTEs in January 2012 than in January 2008. Virgin America reported the largest percentage increase, up 158.7 percent but Frontier and AirTran reported declines. The regional airlines' FTEs were up 0.1 percent in January 2012 compared to January 2011. GoJet and Shuttle America report the largest percentage increases in FTEs from January 2011 to January 2012 among airlines not involved in mergers. Comair and Republic reported the largest percentage decreases. Atlantic Southeast Airlines and ExpressJet Airlines reported separately in January 2011 as did Pinnacle Airlines and Mesaba Airlines while their reports were combined in January 2012. Five-Year Trend: The 14 regional carriers reporting employment data in both 2007 and 2012 employed 6.9 percent fewer FTEs in 2012 than in 2008. Republic reported the largest percentage decline followed by Comair and Mesa. Compass Airlines reported the biggest four-year percentage gain followed by GoJet Airlines. Effective with January 2011 reporting, Republic's employment numbers include FTEs from Midwest Airlines. Midwest employment data were formerly included in the "Other Airlines" category. Regional carriers typically provide service from small cities, using primarily regional jets to support the network carriers' hub and spoke systems.